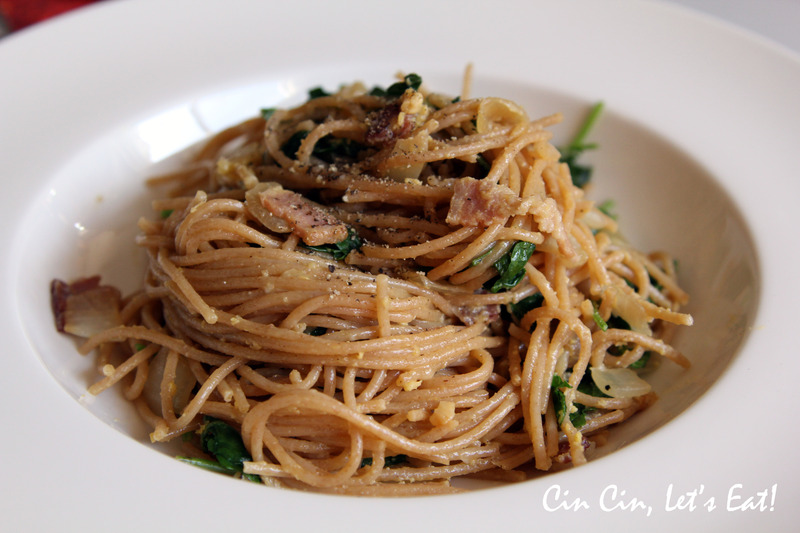 Carbonara Pasta [recipe] – Cin Cin, Let's Eat! Several of my friends asked me what I did with all those egg yolks after making so many batches of macarons (see pink velvet macaron.) Honestly, I was quite baffled by the dozen of yolks at first. I know egg yolks contain mostly fat and bad cholesterol but I don’t like to waste things. I added one yolk to a whole egg to scramble for breakfast, made lemon curd, even used a few for hair treatment – couple of yolks mixed with coconut oil, apply to dry hair, brush, wait 30 minutes, then wash as usual. My favorite though, was to make carbonara. Most people hear “carbonara” and immediately think of ordering from fancy Italian restaurants, but it’s actually super easy to make at home. It doesn’t require any simmering of sauces, simply a quick whisk, saute, and toss! I make a “healthier” carbonara, with whole wheat spaghetti and some tender greens, sans the heavy cream. The idea of adding some greens to the pasta was actually inspired by this vegetarian carbonara recipe I came across. In a mixing bowl, whisk together egg yolks, the grated cheese, some salt + pepper. Whisk until it’s paste-like. Do this step first as you want to mix the raw yolks while the pasta is as hot as possible. In the mean time, heat oil in a large saute pan over medium heat, add onion and bacon to pan and saute until the bacon is crisp. Add garlic and saute for another minute or so. Add in the greens, let them wilt. Drain the cooked pasta and immediately add to the onion/greens mixture. Toss the pasta with a pair of tongs and mix well. Remove the pasta from the heat, then Immediately add the egg mixture to the hot pasta. Toss and mix well. Serve and enjoy! Sprinkle with some extra Parmigiano if you like. Carbonara is one of those dishes that still tastes great lightened up. This looks wonderful. I didn’t realize it was so easy! Thanks! This pasta recipe looks delicious! I work for Kamut International. I bet this recipe would be equally as delicious if made with Kamut wheat pasta. Yum!